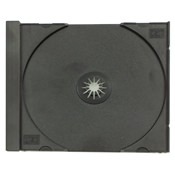 Unassembled CD jewel cases are great for cutting down the time need to insert tray cards and booklets. Also unassembled jewel cases can be used on automated equipment to get large quantities done in a short amount of time. Please note that you will need BOTH, the jewel case box and a tray, choose from black or clear trays.